The nine Tornado GR4s that took part in last week’s farewell flypast over Marham and Cranwell to celebrate the much loved and soon to retire Tornado aircraft continued on Feb. 28 with a farewell flypast of a nine aircraft over East Anglia. The campaign to celebrate the much loved and soon to retire Tornado aircraft continued on Thursday with a farewell flypast of a nine aircraft over East Anglia. Following the hugely popular series of finale flypasts over the UK the previous week, the Tornado force carried out a sortie over Lincolnshire with nine aircraft from its base at RAF Marham in Norfolk. As witnessed the previous week, thousands of onlookers gathered along the route to see the iconic jet for the last time. In the immediate term, the Tornados will be replaced by new weapons capabilities for the Typhoon jet. Under ‘Project Centurion’, worth £425m over the past three years, the Typhoon now has deep strike cruise missile Storm Shadow, air-to-air missile Meteor and the precision attack missile Brimstone at their disposal. The RAF’s new fleet of F-35 Lightning jets will form the backbone of the UK’s combat air fleet alongside the Typhoon jets in the coming years. Nicknamed the "Tonka”, the aircraft’s first use in live operations was during the Gulf War in 1991, when 60 Tornado GR1s were deployed from bases in Saudi Arabia and Bahrain. Two years later they were upgraded to the GR4 model, which has been used ever since over the skies of Kosovo, Afghanistan, Iraq and Syria. -- The Tornado has been on almost continuous operations since deploying on Operation Granby in 1990 returning to the UK on 2 March 1991. They deployed on Op Jural, the southern Iraq No-fly Zone, in August 1992 and maintained a presence in the Middle East until withdrawn from Iraq on 31 May 2009. There was a short lacuna until they redeployed to Kandahar in Afghanistan as part of Op HERRICK on 6 July 2009 until their end of mission and return to the UK in November 2014. The Tornado has also been used in Kosovo in 1999 and in March 2011 it flew against targets inside Libya. Flying 3,000 miles from its base at RAF Marham these missions were described as "the longest-range bombing mission conducted by the RAF since the Falklands conflict”. -- Tornado has flown 185,603 hours on operations from 1990 until its final mission on 31 January 2018. • Tornado Force air strikes in Syria began on 2 December 2015. • Over 100 Operational Commendations and 7 State Awards have been awarded to Tornado detachment personnel for their efforts on Op SHADER. • The Tornado deployment on Op SHADER began with the first aircraft arriving in RAF Akrotiri in Cyprus on 12 August 2014, and the first operational sortie was flown over Iraq the following day. 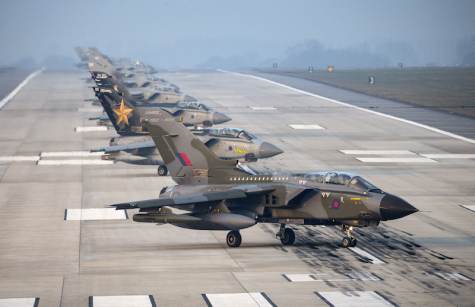 • A total of 41 different Tornado aircraft have flown in support of Op SHADER and the deployed force has been commanded by seven different OCs. • Every member of the Tornado force has completed four Op SHADER detachments and each Tornado engineer has spent over 365 days on Op SHADER on average (some over 600).